At Gilead, we are committed to ensuring that you get the support you need, that’s why we’ve created Momentum HBV, a patient support program designed to assist patients prescribed a Gilead medication. 1. Activate Your Card: Please take a few minutes to complete the required enrolment process. If you would like to be kept informed as future benefit programs become available, please provide consent when activating your card. Once you have completed the required steps, your Momentum HBV patient support card will be activated and ready to use within two hours. 2. Present Your Card: Once activated, bring your card and your prescription to the pharmacy and present them to your pharmacist. 3. Keep Your Card: Please ensure you keep your card for all future pharmacy visits. If you have any questions on how to enroll or on services provided by Momentum HBV, call 1-888-GLD-8885 (453-8885) between 8 am and 8 pm EST Monday to Friday, or talk to your doctor or pharmacist. 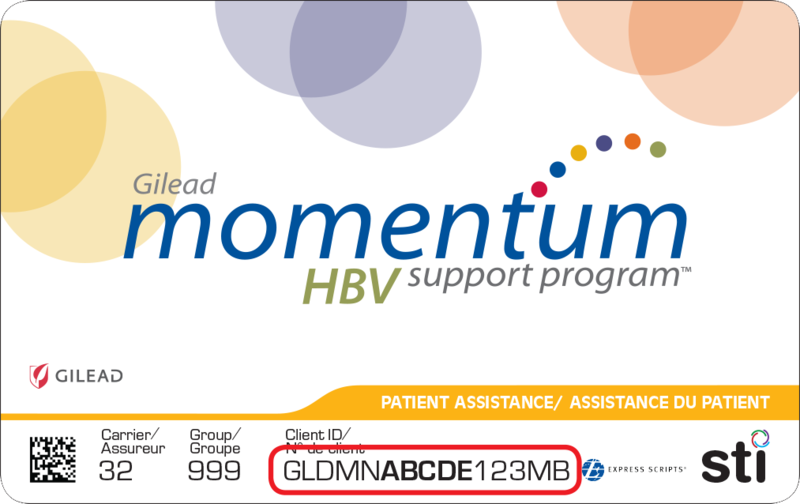 The MOMENTUM HBV Patient Support Program (the “Service”) is offered by Gilead Sciences Canada, Inc. ("Gilead") and administered by an independent third party service provider, STI Technologies Limited (the “Service Provider”). ©2019 STI Technologies Limited. All rights reserved.